The funeral of King Edward VII of the United Kingdom of Great Britain and Ireland and Emperor of India occurred on Friday, 20 May 1910. The funeral procession of King Edward VII, passing through Windsor. The funeral was the largest gathering of European royalty ever to take place, with representatives of 70 states, and the last before many royal families were deposed in World War I and its aftermath. King Edward VII had died on 6 May, and the funeral was held two weeks later. Huge crowds gathered to watch the procession, which passed from Buckingham Palace to Westminster Hall, where a small ceremony was conducted by the Archbishop of Canterbury, Randall Davidson, before a small group of official mourners – the late King's widow, Queen Alexandra, his son King George V, his daughter The Princess Victoria, his brother the Duke of Connaught, and his nephew the German Emperor. The remainder of the funeral party waited outside the Hall, consisting of thousands of people. Big Ben, the bell in the nearby clock tower, was rung sixty-eight times, one for each year of Edward VII's life. This was the first time it was used in this way at a monarch's funeral. The whole procession then proceeded from Westminster Hall, via Whitehall and the Mall, from Hyde Park Corner up to the Marble Arch, and thence to Paddington Station. From there, a train conveyed the mourners to Windsor. The procession then continued on to Windsor Castle, and a full funeral ceremony was held in St George's Chapel. The funeral directors to the Royal Household appointed to assist during this occasion were the family business of William Banting of St James's Street, London. The Banting family also conducted the funerals of King George III in 1820, King George IV in 1830, the Duke of Gloucester in 1834, the Duke of Wellington in 1852, Prince Albert in 1861, Prince Leopold in 1884, and Queen Victoria in 1901. The royal undertaking warrant for the Banting family ended in 1928 with the retirement of William Westport Banting. The Nine Sovereigns at Windsor for the funeral of King Edward VII, photographed on 20 May 1910. Standing, from left to right: King Haakon VII of Norway, Tsar Ferdinand of the Bulgarians, King Manuel II of Portugal and the Algarves, Kaiser Wilhelm II of Germany and King of Prussia, King George I of the Hellenes and King Albert I of the Belgians. Seated, from left to right: King Alfonso XIII of Spain, King George V of the United Kingdom and King Frederick VIII of Denmark. Ceremonial funeral procession of King Edward VII (1901-1910) passing through the streets of London on May 20, 1910. 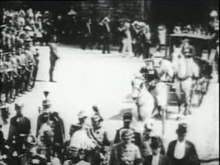 Views of the moving casket, heads of state walking behind the casket, the royal carriage, and various marching military units. Attending the ceremony were Kaiser Wilhelm II, Stéphen Pichon, Kings of Spain, Portugal, Denmark, Archduke Franz Ferdinand, and Theodore Roosevelt. The funeral was notable for the enormous number of important European and world royalty who participated in it. The funeral procession saw a horseback procession, followed by 11 carriages. ^ Tuchman 2014, p. 1. ^ Weinreb and Hibbert, p. 66. ^ Tuchman 2014, p. 6. Tuchman, Barbara W. (2014). Guns of August. Random House Trade. ISBN 978-0-345-38623-6.